The new trio record «MIRA» with Tommy Smith and Paolo Vinaccia is finally ready for release. It will be out worldwide January 17 . I always wanted to do a studio ballad record . After the eruptive excitement of their Live At Belleville album, which was widely praised around the world (and secured for leader Arild Andersen the Prix du Musicien Européen 2008 from the Academie du Jazz in France), the trio now delivers a studio album. In Oslo’s Rainbow, bassist Andersen, tenorist Tommy Smith and Paolo Vinaccia rechanneled their music’s energies into a programme of soulful ballads and mid-tempo free-floating sound explorations. The pairing of Anderson’s muscular bass and Smith’s vaulting tenor is exceptionally compelling (as the recent “Celebration” album also confirmed). 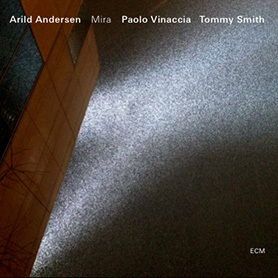 Most of the tunes on “Mira” are from Arild’s pen, though his cohorts also contribute material, and there is an unexpected interpretation of Burt Bacharach’s “Alfie”, beautifully played by Tommy Smith here.